The Estate of Francis Bacon celebrated the worldwide publication of Francis Bacon: Catalogue Raisonné with a one-day, free-admission show entitled ‘Francis Bacon: Six Studies in Soho’ in London on 25 May 2016. The Estate are delighted to say that over 2,200 people attended the exhibition, which showcased six Francis Bacon works alongside first editions of the catalogue raisonné that visitors were invited to browse. The Francis Bacon works on display in Soho consisted of Triptych 1987 (87-05)*, Study after Velázquez 1950 (50-05), Figures in a Landscape c. 1956 (56-11), Marching Figures c. 1952 (52-22), Chicken 1982 (82-03), and Poster for the 1988 Van Gogh Exhibition in Arles 1985 (85-02). 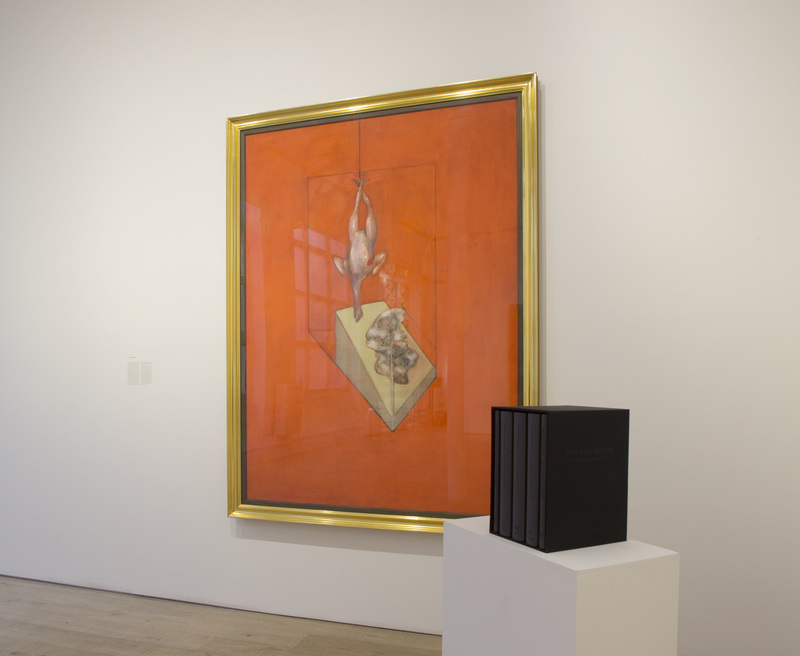 The six works adorned two rooms in the Lexington Street gallery, each accompanied with captions featuring body text from the catalogue raisonné. Francis Bacon: Catalogue Raisonné is a landmark publishing event that presents the entire oeuvre of Bacon’s paintings for the first time and includes many previously unpublished works. The publication, containing each of Bacon’s 584 paintings, has been edited by Martin Harrison, FSA, the pre-eminent expert on Bacon’s work, alongside research assistant Dr Rebecca Daniels. An ambitious and painstaking project that has been ten years in the making, this seminal visual document eclipses in scope any previous publication on the artist and will have a profound effect on the perception of his work. The publication contains around 800 illustrations across 1,538 pages within five cloth-bound hardcover volumes. The three volumes that make up the study of Bacon’s entire painting oeuvre are bookended by two further volumes: the former including an introduction and a chronology, and the latter a catalogue of Bacon’s sketches, an index and a bibliography. Printed on 170 gsm GardaMatt Ultra stock in Bergamo, Italy at Castelli Bolis, the five volumes are boxed within a cloth-bound slipcase. In addition to the 584 paintings, the catalogue contains illuminating supporting material. This includes sketches, photographs, images of Bacon’s furniture, handwritten notes, and x-ray and microscopic photography of the late artist’s paintings. To order an edition of ‘Francis Bacon: Catalogue Raisonné please visit Heni Publishing's website. ‘Six Studies in Soho’ appeared on the BBC’s Newsnight programme on 24 May, featuring an interview with Martin Harrison. *Bracketed numbers represent works catalogue raisonné number.